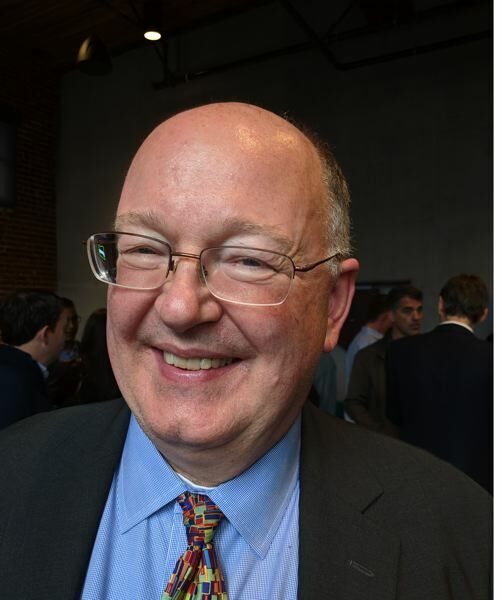 Portland firms put a smiley face on complex crypto technology, as the gold rush begins. Blockchain has officially outgrown cryptocurrencies (like Ethereum and Bitcoin) and become an enterprise computing issue. Law firm Schwabe, Williamson & Wyatt held a technology summit Wednesday, Sept. 12 to which it invited four companies working in the blockchain space and one an official blockchain futurist. 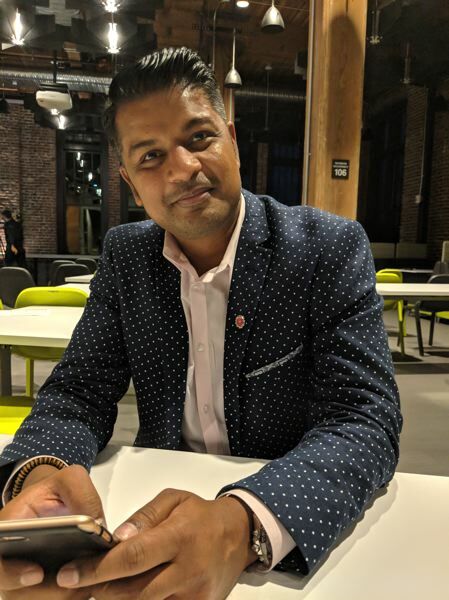 The futurist, Richie Etwaru, came from New Jersey to share some lofty ideas about the power of blockchain and to segue into a pitch for his own 31-person company, Hu-manity.co. They aim to use a unique hash to put a price on people's personal data (medical records, consumer tastes, location information) so people can sell it rather than keep giving it away to corporations. Etwaru's big idea was that the economy goes in periods. He said from about 1960 to 2000, companies competed on price and quality. (Credit cards hard launched the era of mass consumption.) This was accompanied by a smiley face emoji. He showed a graph with an X axis where this period began with Bill Clinton's face in 2000 and ended with Donald Trump's in 2020. Business opportunity declines to zero in 2020, marking the end of the feeling era. 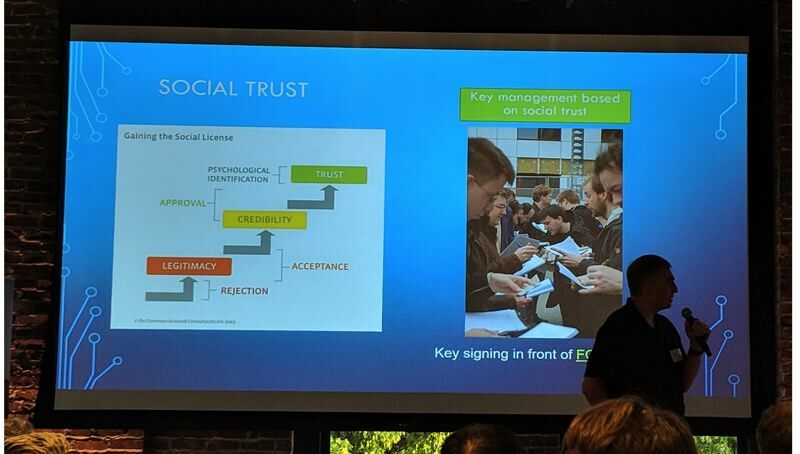 The key issue of e-commerce is figuring out how to trust each other online. That has spilled over into all sorts of online activity, such as reading. Blockchain is putting an end to this period because it finally allows us to trust who we interact with online (particularly in commerce), and how to spot fraud. "Regardless of what you care about the current president of the United States, there's one good thing that will come from him. Which is, we're going to get really f---ing good at spotlighting fraud. Think about news articles. A year and a half ago, no one looked at the URL. Buzzfeed was a great website that reported facts. Now we look at the URL." Etwaru says the companies that incorporate a few years before the big reset or change in periods are the ones that win: Amazon, Google, Facebook etc. They're very hard to catch up to, although new companies could survive. The thing that really excites him about the blockchain revolution is if you get in on it now (before 2020) you have a good chance of lasting longer. Because it's about trust, it makes it very hard for latecomers to join the party without seeming insincere. Etwaru wrote a book called "Blockchain Trust Companies, Every Company is at Risk of Being Disrupted by a Trusted Version of Itself." He gave the imaginary example of a new airline that uses blockchain to be transparent in its pricing, its safety record, its history, etc, and as a result, keeps its prices steady. This would contrast it with a mainstream airline which increases its prices around the holidays. His imaginary airline would win customers because blockchain makes it easy to trust it. And if other airlines copy it, it's already too late. "Loyalty and trust will be the differentiator." The emoji for the coming period is the smiley face with a halo. Pitching his own company, Hu-manity.co (which he said he might move to Portland) he theorized that it took humanity a long time to quantify labor. Slavery and serfdom ripped people off, but now we have time cards and payroll services to keep the bosses honest. Creativity was next — patents and intellectual property laws protect people's greatest achievements. Next will be the cloud of personal data we generate every day. 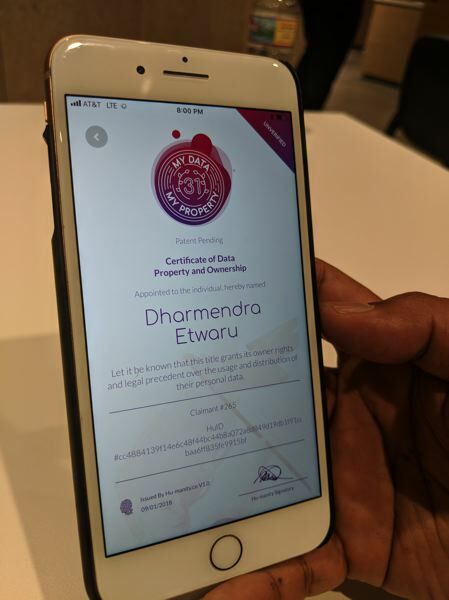 "You can negotiate who uses your data," he said, with the help of Hu-manity.co. He also pointed out that paradigm shifts seem to be accelerating. The Internet was one paradigm shift. Then came two together, cloud and mobile computing. Now we are living in a triple shift: blockchain, artificial intelligence and the Internet of Things, all at once. "This is causing massive dislocation. Commerce feels fickle and exciting now." 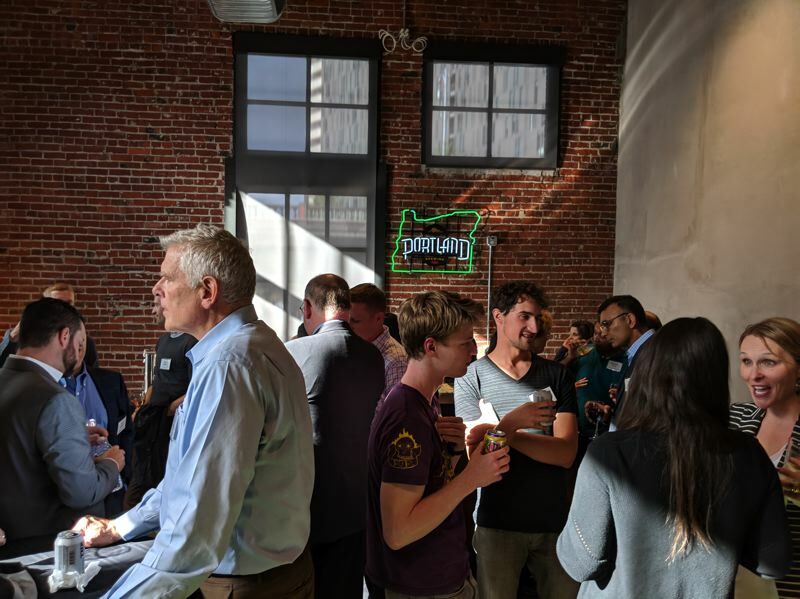 Jeff Gaus of the Oregon Blockchain Venture Studio said the state of Oregon, through Business Oregon, has made a "multi-year, multi-hundred-thousand-dollar" investment in the studio. He said the plan was to build the economic activity around blockchain for current industries, as well as attracting new ones to the region. They voted in July that the initial investment will be at least $250,000. The studio will invest that money in the companies it is nurturing, between 6 and 10 per year for the next three years. "They're companies solving specific problems, with blockchain as the underlying technology. It could be identity and security, it could be supply chain and chain of custody, transportation and smart cities, Internet of Things, the power grid, civic technologies, health and wellness…"
The studio will look at 500 companies per year. The investors tell him what problem they want solved and collectively they agree on the six to 10 problems they're going to chase, then put out a global RFP. They will bring the companies for four-month incubation process, in the hope that things work out and they want to stay. "It's up to the Oregon community to make them want to stay here. It's more than Blue Star and bicycles, we have to have the investment community, real estate, the workforce. Portland state is our education partner, they're developing a curriculum around blockchain." "It's easy today 40 years later to say we have a sportswear performance cluster, what's challenging is to say here's a thing that's happening (blockchain), let's build an ecosystem around it. This will be the first of its kind in the country." Gaus explained the difference between an incubator, an accelerator and a studio. An incubator takes rough ideas to see if they could become a technology, then a product and then a business. An accelerator takes a technology or a company and scales it up. "A venture studio takes an idea, a pain point from our investors, and takes it out in the market to find a solution, then brings it back in so it has a product market fit." The studio has state money and corporate partners. "They're helping us in this quest to build this ecosystem." He said they'd incubate a company for four months, try it out inside an investment partner, then scale it up. One partner in this is R/GA. "They've got a phenomenal track record. They're here in Portland and they've got an investment arm that is plowing money and resources into this. Portland has this phenomenal confluence of technology, raw talent, Intel's got a blockchain stack built here, and they have all the sensor technology, and we have brand number one invested in this, in Nike." About which he can't say any more. Matthew Davis is director of brand innovation at Nike. His group is focused on where to carry the spirit of the brand. He couldn't say much publicly yet about why Nike was at the summit looking at blockchain. "It's an ongoing situation. 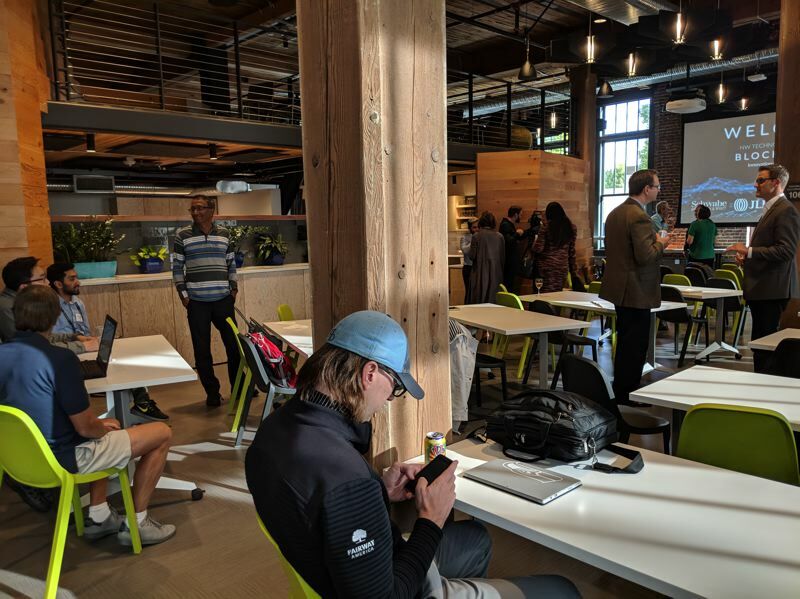 As a leader in digital commerce, Nike is supportive of creating a center of excellence in Portland for this technology with the potential to secure, share and protect personal and business data. And that's where we belong." At one point in the technology summit, speakers took the stage from four blockchain-friendly companies. Public Market COO Robin Jones talked about how third-party merchants on the big marketplaces such as Amazon and eBay are locked into prices. Those platforms don't allow you on them if you are selling the same product elsewhere for cheaper, and they take 15 to 40 percent commission, Jones said. Public Market has an elaborate token system, based on Ethereum, for rewarding sellers for keeping transactions on their own sites. In return they get a relationship with the buyer. Coinbase corporate development executive Justin Mart talked about how cryptocurrencies will only mature as they become easier to use, which is the goal of his company, which recently hired a hundred positions here. Someone asked how governments would collect taxes when cryptocurrencies are an open financial system. Mart said he didn't know, but maybe they would collect them as sales taxes rather than income taxes. Ben Conte, the director of LO3 Energy, explained how the traditional electrical grid needs upgrading. It is designed for sending out electrons from a centralized location, not taking back power from millions of homeowners with their own solar panels, measuring it and redistributing it. They call this a microgrid, where people can pick and choose where and when they get their electricity. LO3 makes a smart meter and its Exergy application tracks individual customer electricity use. The room was palpably excited as people strained their ears for nuggets of wisdom. Many people feel blockchain is bigger than a buzz word. 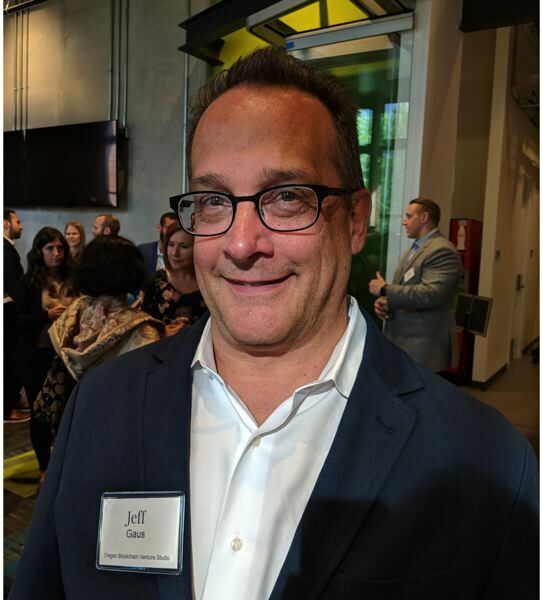 Donald L. Kramer Jr. a corporate lawyer in technology industry group at Schwabe, Williamson & Wyatt said he first heard about blockchain around Bitcoin four years ago. "I've been involved in this thing for 20 years so I always like to get on the front end of stuff," he told the Business Tribune. "I do think this has legs to it, it crossed a lot of different industries." Kramer said the firm switched to six industry groups two years ago, and they try and keep an eye on emerging technologies. "But this is fundamentally different. Coinbase was looking at other places, like Denver, but they settled on Portland which is them saying, we've got good segments that are supportable, and their innovation they'll be the gazelles of the next generation."